It seems like I have been sharing a lot of breakfast recipes of late on this blog. As I mentioned on a post or two ago I love breakfast. I can’t say that enough. As my mother and probably your mother told you breakfast is the most important meal of the day. I can remember my mom saying those words when someone didn’t want to eat their breakfast in the morning. Not to me of course, because I have always been a breakfast kind of person. I am a big fan of oatmeal in the morning. You can always find a container of it sitting in our pantry. Until my blogging days I never knew how versatile it was when it comes to breakfast. 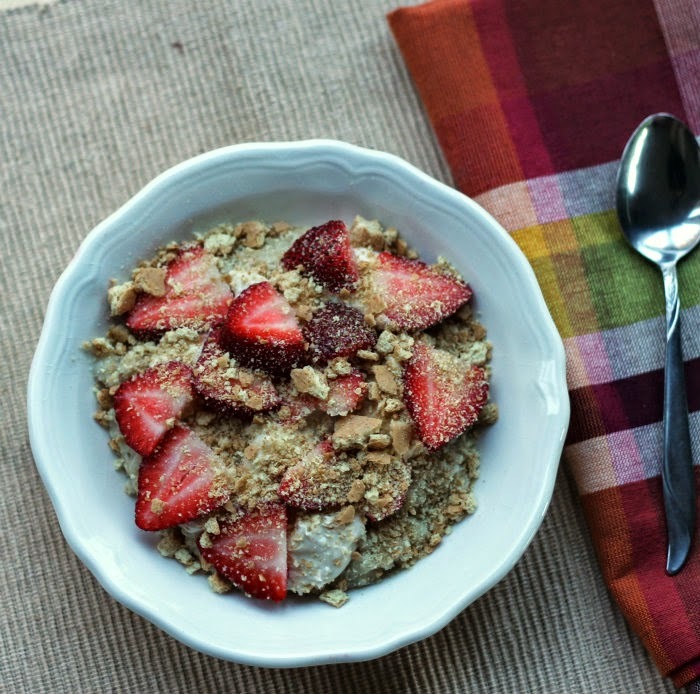 I have shared a few different oatmeal recipes along the way and today I am sharing one that I really enjoyed. 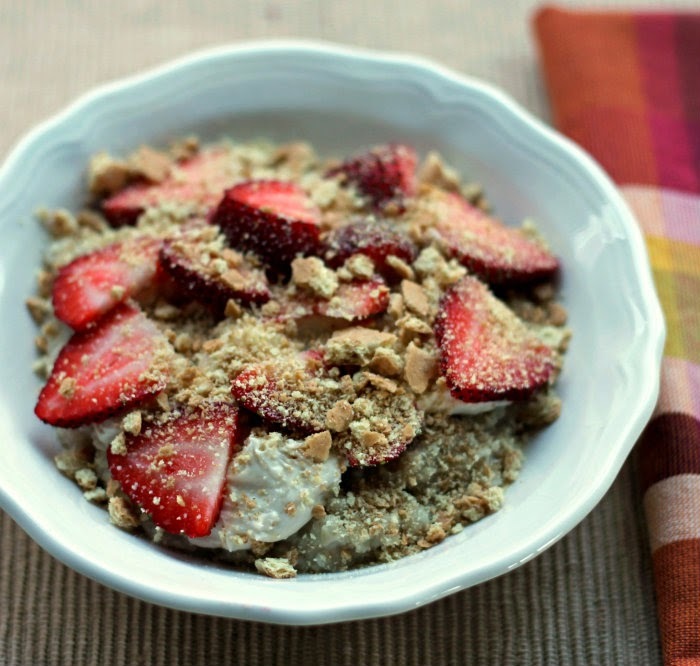 This one is nice and easy and if you use quick oats like I did it takes no time at all to have your breakfast ready. 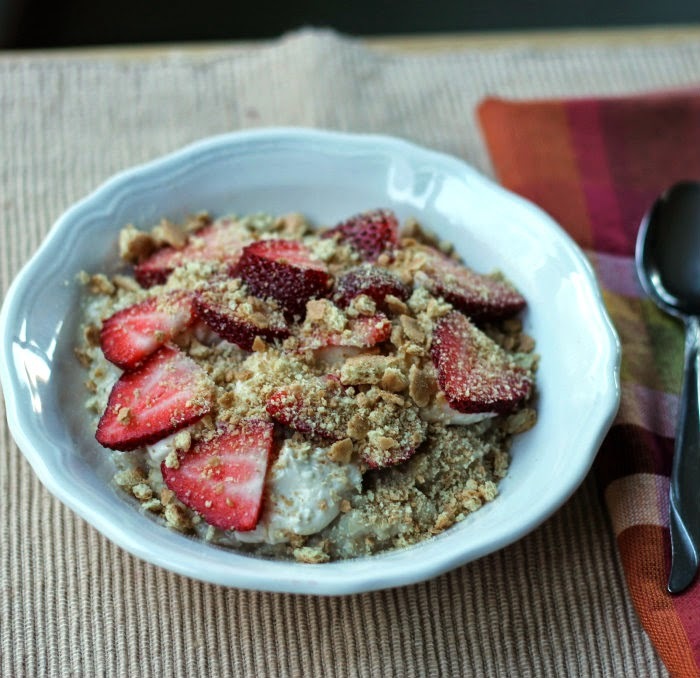 The sweetened cream cheese, strawberries, and graham cracker make it seem like you are actually having dessert for breakfast. 1. Prepare oatmeal according to the direction on the package. 2. While the oatmeal is cooking place the cream cheese, vanilla, and sugar and whisk until well blended and smooth. 3. Once the oatmeal is cooked top it with the cream cheese mixture. Slice the strawberries over top of the cream cheese. Crush the graham cracker and sprinkle over top of everything. I’m up for eating my dessert in breakfast form! And even if this is much healthier than real cheesecake, I bet it still feels like an indulgence, which is always fun in the morning! When I first saw the name of this recipe I never thought it would be this quick and easy. Younger son’s gonna love me for this one. Avena y fresas que bueno. Yes, and yes…dessert for breakfast! Love this idea…and all the different textures in this bowl.